Putting an app on sale is much like launching a new website. The only difference is that the new website doesn’t require a 2 week waiting period from one of the largest companies on Earth. Today we were happy to hear that Apple has approved MileIT, the newest App from Three29 and Trial Tactics, now for sale in the Apple App Store. MileIt is one of those apps that when someone tells you their idea you shake your head and wonder, “why didn’t I think of this?” That’s exactly what happened when Will Price of Trial Tactics called me on the phone to discuss this app because he needed an easier way to track mileage for his business. There are other apps in the app store that claim to “track your mileage,” but none of them come close to the features or sophistication of MileIt. The genius behind MileIt is the integration of GPS tracking as you drive. Instead of just logging your miles in by hand, you tell MileIt where you’re coming from, set your odometer reading (if you use it) and hit Start Trip. When you’re at your location tap Stop Trip and tell MileIt where you went. It’s really that easy. MileIT does the rest. As you drive, MileIT will track your route using standard iOS Maps and calculate your total driving distance. That trip data is then stored on your iPhone and categorized by Month and Year. If where you went From and To is not enough, MileIt lets you log the client, the car you drive and any optional notes you may have about the trip. When your month is complete, simply export your mileage as a CSV and email it to yourself, your bookkeeper or your accountant. It is a no-brainer for any small business owner or employee who has to log their mileage for work. Save and earn money while you drive, with the tap of a button! 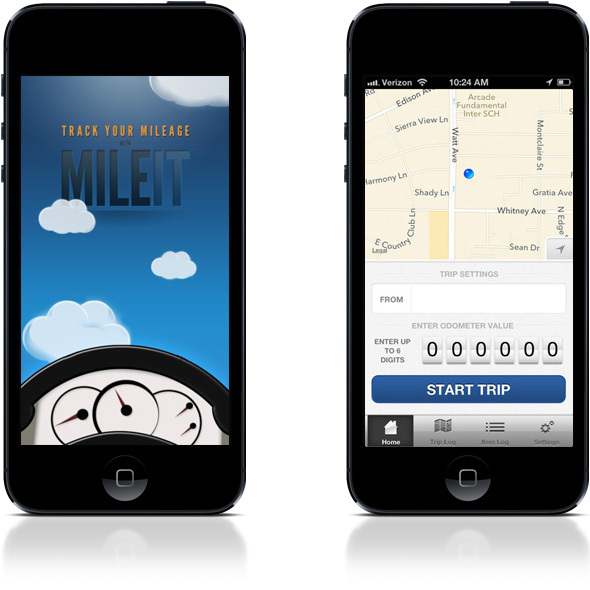 MileIT uses GPS to track your miles as you drive, and allows you to keep a log of your trip details. Use the logs for all of your tax deductions and business reimbursements. Store multiple vehicles, clients, start & end locations, and trip descriptions for easy retrieval and assignment to trip logs. Easily keep track of any trips done for business and export them to an Excel or Numbers compatible CSV file for simple logging. Powerful yet easy-to-use, let MileIT save you money and simplify your life. To stay up to date on MileIT you can follow them on Twitter @MileItApp or like their Facebook page.Visit their website for more information or simply purchase it for only $1.99 from the app store. Trial Tactics is a full service litigation technology firm located in Sacramento aimed at providing you with the tools you need to present your evidence efficiently, effectively, in the highest quality, and at the most reasonable means. They provide a wide array of services to assist you in any level of proceeding, including document imaging, video management, equipment rentals, courtroom setup, to full litigation support and database management. Trial Tactics can help streamline your entire litigation process, from research, organization, preparation, to courtroom presentation.